[HK] 一蘭 | Ichiran - Classic Tonkotsu Ramen from the 60s! 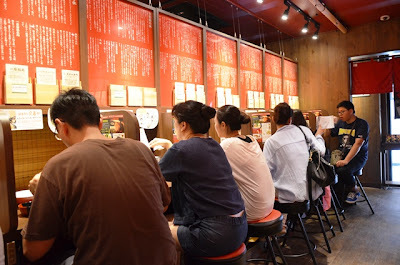 Concentrating on serving just Tonkutsu Ramen, Ichiran's priority lies in the safety and satisfaction of each and every customer. 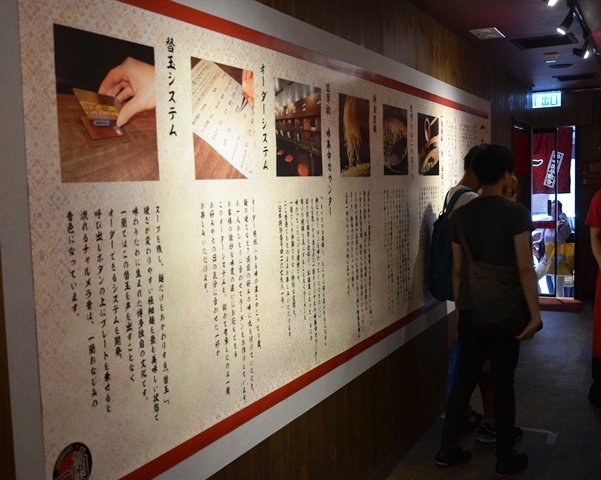 The mission of Ichiran is to deepen the flavour of every bowl of noodles served, each involving the work of over 40 specialists. The Japanese are well-known for their high level of exquisiteness and at Ichiran, it was certainly heightened to the next level with the complicated techniques involved in the ramen-making process. What makes this bowl of ramen so special? 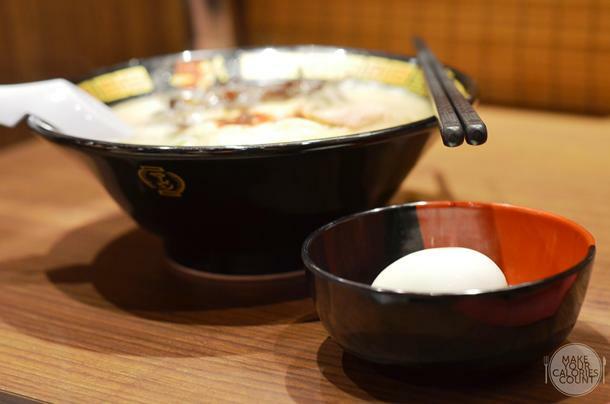 There are actually 8 elements which each contribute to the masterpiece bowl of Tonkotsu Ramen. Essentially what Tonkotsu means in Japanese is pork bone so before we move on to exploring the taste and flavours, let us dwell upon the basics that Ichiran focus on in creating the perfect ramen. After years of improvising, the cooking process of the broth had been split into two which focused on using special methods to remove the 'heavy' and appalling smell related to pork broth. 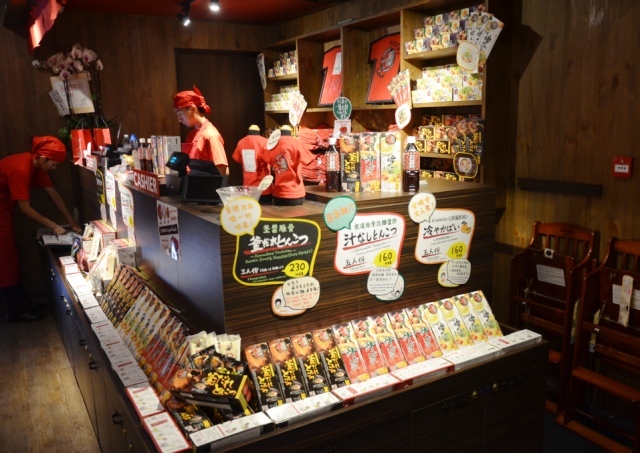 This would surely appeal to those who crave for a touch of spiciness in their ramen as Ichiran develops their own red-pepper based sauce which involved 30 types of spices, aged and cooked slowly for days and nights before being served to the customers. With an in-house unique blend of flour, the experienced chefs at Ichiran create their own version of noodles using special techniques to have that uniquely smooth texture. The thinly sliced pork had been specially prepared and marinated to concentrate on the natural sweetness of the protein. You have the choice of adding or omitting this from your ramen but these specially grown green onions offer freshness and quality. The fertilizer used in cultivating these green onions were recycled from the pork bones after they were used for producing the broth for the ramen. Organic and environmental friendly. 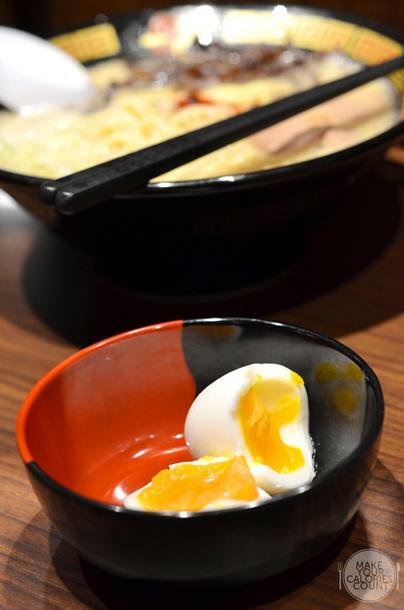 The natural oil used at Ichiran are self-produced and completely trans-fat free. 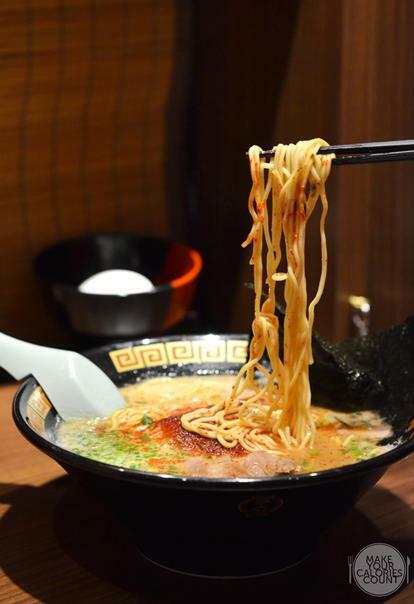 They claim to be the first ramen company in the world to offer trans-fat free tonkotsu ramen. The broth is apparently rich in collagen which helps the body to gain flexibility and improve skin's complexion. Delicious and nutritious. The water served had been carefully selected for the preparation of products. The quality of the water is controlled through Ichiran's special system of pipes and purifiers and has the characteristics of bringing out all the flavour of the noodles making them firm and resistant to expanding once in the soup. It is also delicate and soft to the stomach and liver so feel free to drink more! 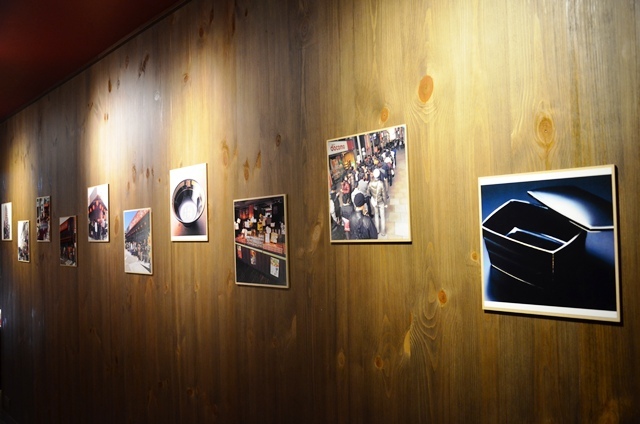 There is a tap available at table to allow free-flow of iced Ichiran original water! Now that I had hopefully portrayed a better picture about what to expect, let us bask in that authentic Japanese ramen experience! It was considered a short queue of about 30-40 minutes before we got a seat. 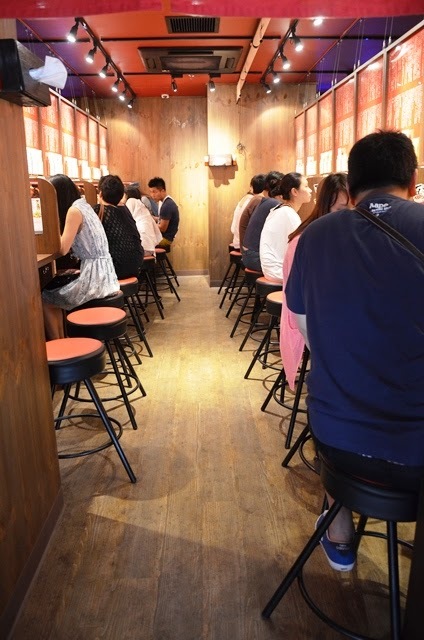 Such a waiting time is considered good since it was reported that some people queued for 4 hours under the hot summer just to have a taste of that tonkotsu ramen! According to our friends residing in Japan, even the Ichiran restaurants there have similar queue times. Expect the queue to continue inside the air-conditioned restaurant which was a relief from that blazing sun out there! 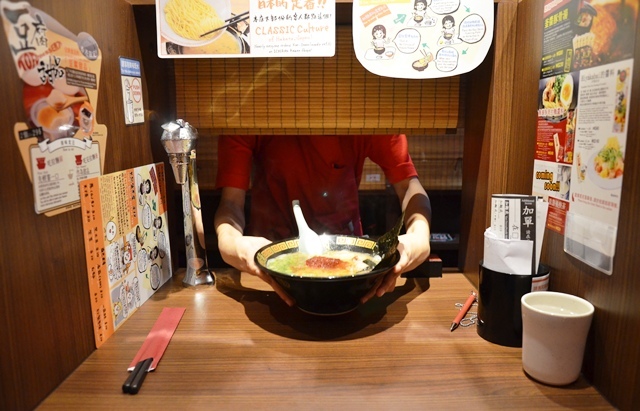 The authentic ramen experience starts with securing a seat! It is worthwhile to note that as all seating are individually allocated, diners in groups would have a high chance of sitting separately from each other. 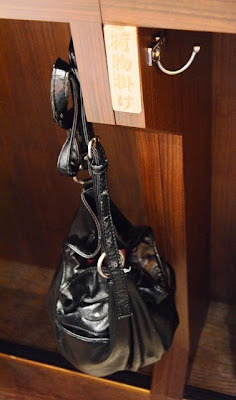 Each table had hooks underneath for the customers to hang their bags and carriers. 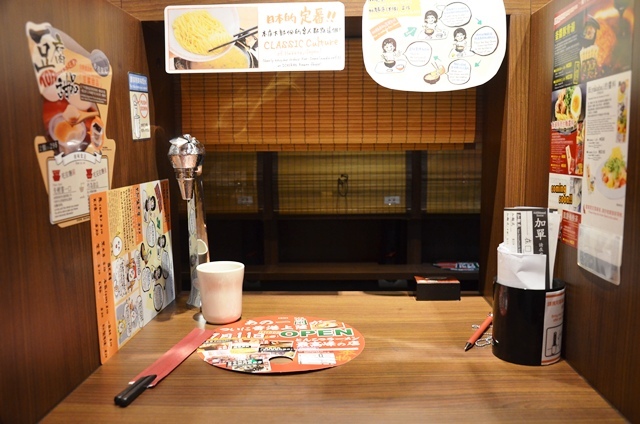 The free-flow iced Ichiran original water tap is located on the left corner of each table allowing easy access. You will be issued with an order chit upon walking into the restaurant and you would have the option to choose the density of broth, texture of noodles (limp or firm), level of spiciness (max level is 20 times at an additional charge of HK$10. Essentially, each and every bowl of ramen is customized to your preference. 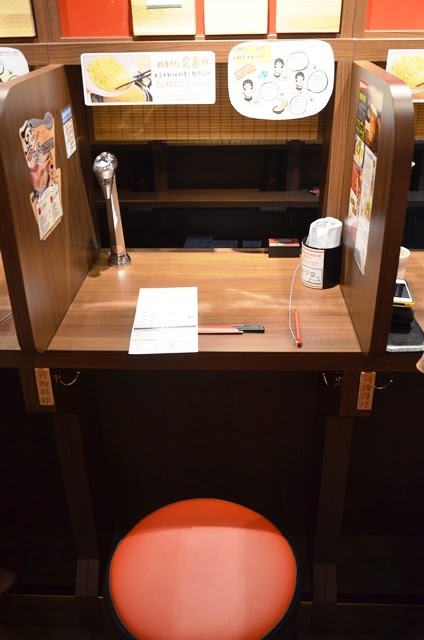 Once you are comfortably seated and ready to place your order, you could press the bell located on the top right hand of the table to get the attention of the service crew who would be humbly serving you. In fact, I never got to see how the servers looked like though they politely greeted us in Japanese when we were ushered to our seats. Are you as hungry as us yet? Serve up the noodles, please! My bowl of Tonkotsu Ramen came with add on of 10 times extra spicy but quite frankly the heat was not as strong as expected. The pork bone broth was intense as I opted for it to be served extra strong and it was savoury and rich. It was really fragrant and there was no hint of that appalling porky smell in the broth. The sliced pork was tender and succulent and cooked to perfection, maintaining a natural sweetness which was intended by the chefs. I also chose the finely sliced green onions which enhanced the aroma of the ramen as I drew up those bouncy hand-made noodles from the broth. Despite taking some time in the routine photo-taking, the noodles did not expand nor become limp as I selected mine to be firm. The texture was surprisingly smooth and the only complaint I had was that the serving might seem a little meagre for the gents. There was a sign which explained the culture of enjoying the ramen at Ichiran where most customers would request for noodle refill which was termed kaedama. 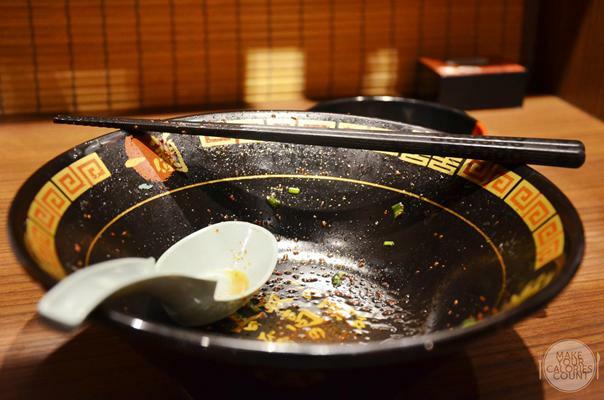 It is Hakata's unique way of enjoying more noodles in one ramen serving and the mantra is to leave at least half of the soup from the first serving to enjoy a refill of noodles. As ramen noodles are characterised for expanding in the soup as time passes due to their thinness and delicacy, the system of kaedama helps to solve this problem and allows the customer to better enjoy the texture and aroma of the ramen. The second bowl of Tonkotsu Ramen ordered by the lady was slightly different as she went for the most standard bowl of noodles with different elements ticked to be of normal serving. 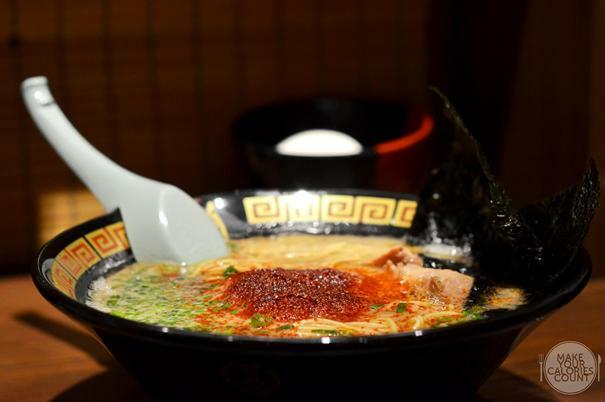 The richness and savouriness of that broth overwhelmed any hint of heat, so if you enjoy your ramen to be spicy, you could surely go for at least 5 times extra spicy on the order chit. We each ordered an half-boiled salted egg which came at HK$12/- each but it did not impress us. We also added the black fungus and seaweed which came at surcharge of HK$10/- each. We also had a separate serving of their home made vinegar which also came at HK10/-. Admittedly, we were not quite sure what to do with the vinegar - if we were to add it into the broth or as a dipping sauce. We added it into the broth but was unable to taste much difference in taste. It was overall a really authentic experience starting with the ordering process right through to slurping up the last drop of that beautiful broth! For those who fancy enjoying the Tonkotsu Ramen, you could buy the pre-packed noodles and cook it with ease back home with all the necessary instructions and seasoning included. There were two other types of ramen to choose from and you could enjoy them dry or cold, which was not available at the restaurant itself. The prices reflected on the menu were nett and there was no further 10% service charge being imposed. 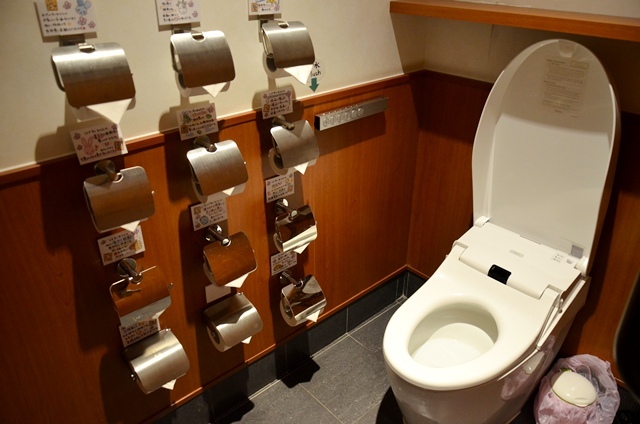 Before leaving, it would be worth visiting their toilet for novelty's sake. There were 12 toilet rolls, each belonging to a different zodiac! 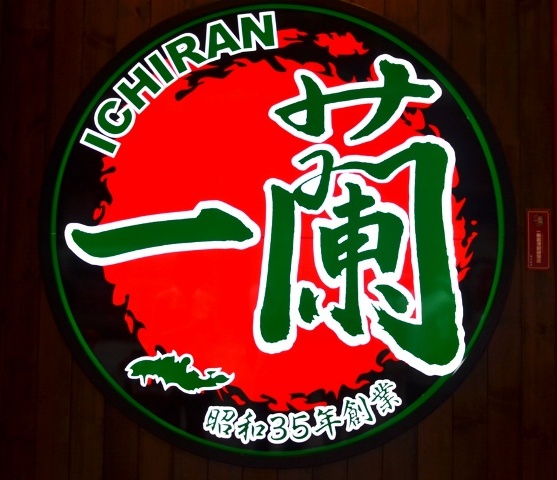 Although the overall dining experience at Ichiban seemed authentic enough and I personally would recommend to try the ramen due to that irresistible broth and noodles, I am not quite a fan of joining long queues for my food. I find that the joy to eating lies in dining with the right company and it is an element which was sorely lacking since everyone was obediently seated in his/her slot, facing the shutters and hungrily slurping up a delicious bowl of noodles. Label me traditional or indifferent but I think I would enjoy my meal more facing my partner rather than a wall, so to speak.